The super middleweight division has lacked a strong identity since the era when it was dominated by Andre Ward, nearly a decade ago. Between 2009 and 2011, Ward cleaned out the division through the historic Showtime Super Six tournament. During that two-year run he established his greatness by easily handling the like of Carl Froch, Arthur Abraham and Mikkel Kessler–all likely Hall of Famers. George Groves made an honest bid to claim that vacated spot. Early in his career he topped fellow Brit James DeGale. He went to the brink of true stardom in two fights against Froch–he gave the older man all he could handle, but was ultimately knocked out in both cases. He lost a third fight by split decision to Badou Jack, who now campaigns at 175 pounds. 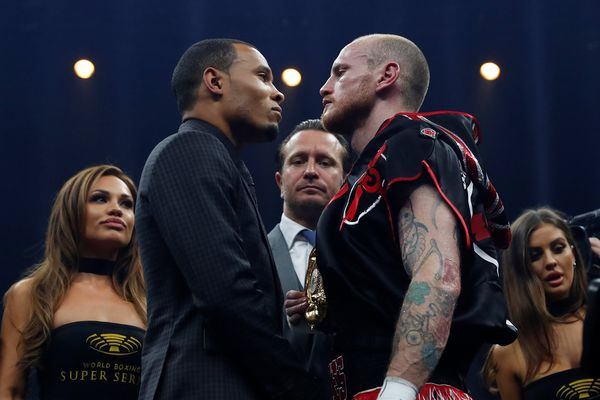 Groves returns to action this weekend in Manchester, when he faces Chris Eubank Jr. Eubank’s father, of course, was a major British star at 168 pounds in the 1990s. Now the son will attempt to run his father’s former weight class. Eubank has lost just once in his career, to Billy Joe Saunders at middleweight in 2014. At 168 pounds, he has won three straight fights–including a near shutout decision against Abraham. If anything, Eubank has looked to be a stronger fighter since moving up. The two-fight rivalry Eubank Sr. had with fellow Brit Nigel Benn marked a high point in the history of the super middleweight division and in British boxing as a whole. Those are big shoes for Eubank Jr. and Groves to fill this weekend. Nevertheless, expect a cracker of a bout.